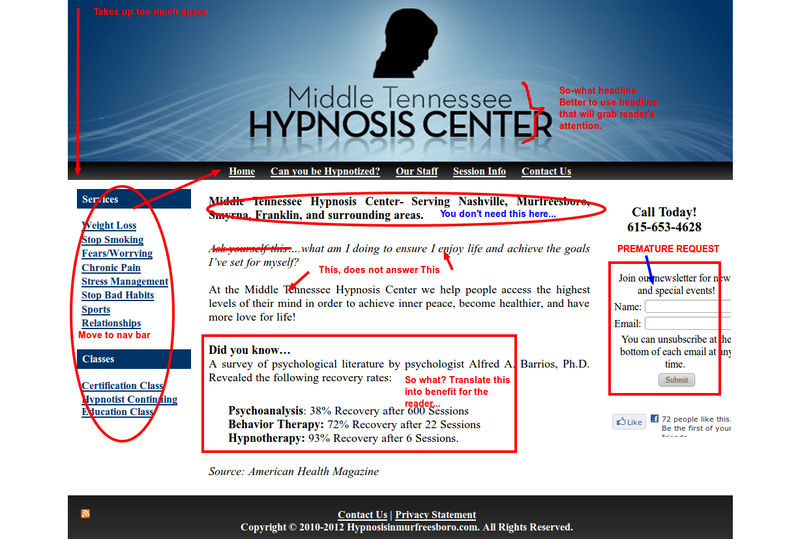 Why not move "Middle Tennessee Hypnosis Center" to the top left and in smaller font? In its place, use a headline that will tell the reader the advantage or benefit from what you have to offer. Left sidebar - remove it and have everything on the navigation bar that's under your blog title (Home, Can you be Hypnotized, etc.). This way, your audience' vision can focus on your message. 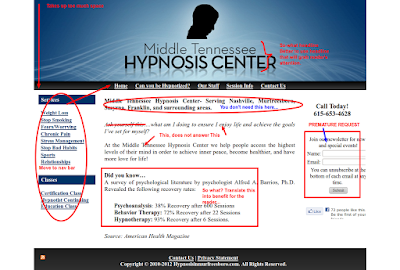 "Middle Tennessee Hypnosis Center- Serving Nashville, Murfreesboro, Smyrna, Franklin, and surrounding areas." Remove this, or move them to a different page altogether. Your website doesn't have a lot of meat that your audience can chew on. this means that you need to tell them more about hypnosis, what are the benefits of hypnosis, who will benefit most from hypnosis, is it safe? Put yourself in your audience's shoes. Imagine what are the common concerns that they have with regards to what you offer. Pick out the most urgent problem. You can either use that urgent problem as your headline, or use the specific solution that you can offer as the headline. Your website's landing page only talks about yourself Talk about their problems. Show them that you understand what they are going through. Your audience will not click on your other links unless you gave them enough information to motivate them to look around.